economy and rural life’), deals with the role the agricultural sector played within and for Dutch national economy and how aspects such as knowledge, know-how and communication influenced this role according to Sloet. The chapter starts with a short description of agriculture in Overijssel in the nineteenth century. The first question in this context is how Sloet valued the situation of agriculture in The Netherlands and its developments, especially in the province of Overijssel. Secondly, which arguments does he pose for the different views there are on this issue? A third question is what Sloet has contributed to the development of agriculture, both nationally and in Overijssel? Finally, can he be considered a representative of a certain group or did he occupy a special position within Dutch agriculture? Sloet saw the agricultural sector as full of potential, some of which was also realised. Although this filled him with satisfaction and delight, it was no reason to sit back complacently, because new situations and developments also created new opportunities which needed to be utilized. The overall goal remained to explore and exploit the treasures of nature which became available through agriculture and, of course, otherwise. Farmers had a specific and important role in this process. For the eastern part of the Netherlands with its specific agrarian characteristics Sloet thought the best option was to develop the small family business. In a way and avant la lettre this manner of thinking fits within the later theory of Ester Boserup who speaks of ‘the relation between population growth in a certain ecological system and the changes in agriculture, more specifically 338 the intensification of farming, which are a result of this growth’. Sloet considered ecology and economy to go hand in hand and according to him developments in the agricultural production process were determined by natural circumstances. But it was up to man to recognize these circumstances and to make use of them and improve them. Only then could the population grow. The necessary employment could amply be found in the countryside. Sloet considered investing on a small scale, such as providing seeds and simple sausage recipes better than introducing large farming equipment which would mostly benefit the big farmers. Modernization of agriculture should therefore aim at the small peasant family business. Rather than for mechanization Sloet opted for the use of human labour as a means to increase productivity. Where the second question - of the different views on production development in agriculture- is concerned, Sloet simply does not provide us with the necessary statistics, despite his efforts. He did recognize, however, the rapid growth in population, the resulting pressure on the soil, the necessary intensification in agriculture and the just as necessary improvements of the infrastructure with, of course, the opportunities which these developments created. Van Zanden’s thesis, that up to about 1870 the influence of ‘institutions’, organizations and institutes on actual farming had been small, needs to be questioned. The existing agricultural societies before 1870 certainly made their contributions, especially Sloet’s Agronomic Congresses and, where Overijssel is concerned, ‘Welvaart’. Sloet was living proof that ‘people do make a difference’. This also forms the beginning of the answer to the third research question, namely which contribution Sloet has made to Dutch agriculture, and especially that of Overijssel. By using his countless connections in politics, the Agronomic Congresses, among men of science and farmers, with his knowledge of national and international literature on the subject and last but not least on the basis of his own observation, he was the seemingly tireless stimulator behind small but indispensable little pulls at the lever of prosperity. To his great dismay and despite his efforts of many years he did not succeed in causing the tithes, a tax which he considered to be harmful to the development of agriculture, to be abolished. 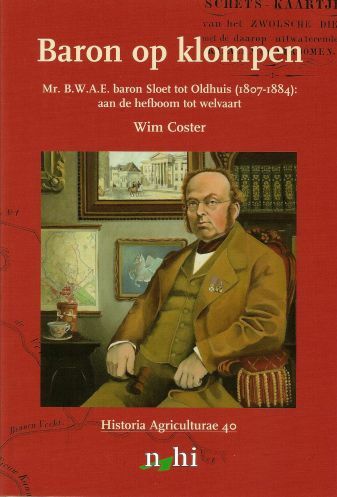 The answer to the question as to what extent Sloet has taken up a position of his own in Dutch agriculture is closely connected with his descent and the region he grew up in. His childhood in Gelderland gave him direction and shaped him – as it had done his father and mother before him – into a tool of progress in the countryside and it made him an exponent of rural life. Not because he desired to play the role of ‘gentleman’, but for the love of his surroundings and the people with whom he felt connected. With his ‘physico-theological’ way of thinking as a liberal politician, economist, governor, man of letters and as a folklorist he is indissolubly connected with the agriculture and the countryside of The Netherlands and especially the countryside of the eastern part of The Netherlands or the ‘Saxon’ countryside, as he called it. All together this creates a colourful and original person. In a sense Sloet was born in the wrong environment. He was different; he was a baron in clogs. However, if he had been a farmer in clogs he would not have been able to achieve the things he did by being the man he was.